Tips and tricks to help you land more head shots. Our Fortnite: Battle Royale Sniper tips and tricks page contains all sorts of advice to help you become a better sniper and outlast the competition. 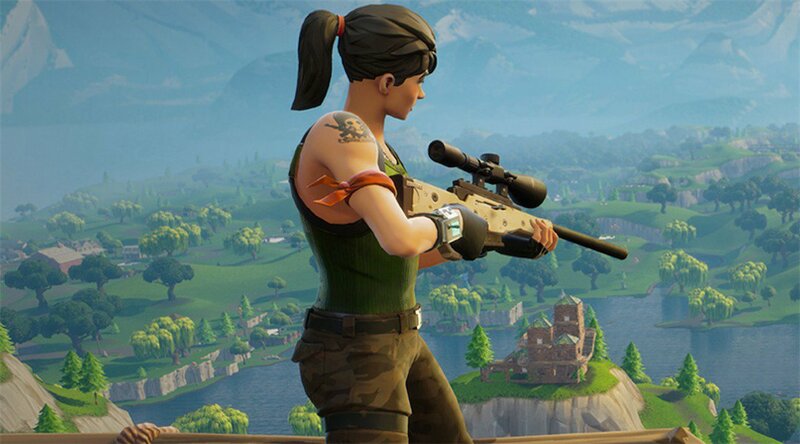 Getting hold of a sniper in Fortnite: Battle Royale significantly increases your chances of surviving the endgame fort-fest. It gives you a fighting chance when everyone’s holding out in their towers and it allows you to pick off poor stragglers out in the open or those desperately sprinting away from the blue force field. Trouble is, snipers are notoriously difficult to use. Almost every other weapon in Fortnite: BR fires bullets that’ll hit their targets instantly no matter how far away they are, but snipers are subject to bullet drop. Not only this, but they’ll also leave you vulnerable if caught out in the open, and leave you scrambling when forced into a close range skirmish. To help you get to grips with sniper rifles in Fortnite: BR, we’ve put together a number of tips and tricks that’ll improve your accuracy and positioning. Once you’ve read this, we guarantee you’ll at least come away a more competent headshotter. Below you'll find a list of helpful tips which'll elevate your sniping skill. Remember, once you've taken it all on board, make sure you go away and practice. Forget about winning and focus on improving, this way you'll get better - fast. Here's the most essential tip - remember that bullets from snipers are affected by distance travelled. This means you have to adjust your aim to take into account bullet drop over time depending on how far away your enemy is. The further away they are, the higher your reticule needs to be for that bullet to land on target. If they're running in a straight line, you've got to aim ahead of them to take into account the bullet's travel time. Another tip for those of you who are struggling with bullet drop. Fortnite: BR's bullet drop is notoriously strong, meaning that you've really got to exaggerate how far you lead your target or aim above them. Be confident with your aim, and if your bullet whizzes past your target, don't panic and just try again. To get better at sniping throw away any reservations and go for your shots. Think about your positioning. It's essential that you're not lining up shots out in the open or right next to another enemy. Before taking a shot, ensure that you've given yourself the best positional advantage over your opponent as well as scouting out any defensive opportunities just in case things go awry. This one might seem obvious, but it's best to go for headshots if you've got the chance. They deal so much bonus damage you can often pick off targets in one shot! If you've got a particularly slippery target, landing shots and finishing off your foe can be pretty tricky. In these situations, prepare to swap weapons quickly after hitting your opponent with a sniper bullet so you can swiftly pepper them with a quick spray down. It's surprising how much ammo you can get through when taking pot-shots at enemies. Remedy this chasing loot and keeping an eye out for ammo crates. When engaging in a sniper duel, make sure you're covered from all sides and listening out for any sneaky enemies looking to encroach on your turf. On top of this, try and be creative. Bait out shots by purposefully poking your head out at random intervals and prep for shots when you know they've just reloaded. Keep tabs on your opponent, find those little advantages and you'll be winning duels in no time. Make sure you check out our Sniper Shootout guide for extra advice! Those are all the tips we've got for now, but make sure you keep checking back as we'll continuously update this guide with more sniping strategies over time!